First of all I have to give all of you who have paid for subscription to the magazine a huge thank you. We are currently ahead of business plan and that is all down to your willingness to pay for content. I'm hoping that we can continue to make the magazine worth your subscription and with the plans we have for next year I think we will do just that. So, I'll say it again, thank you for suffering our teething issues without complaining; thank you for your kind comments and thank you for recommending the magazine (I know a lot of you have!). What's in this issue then? 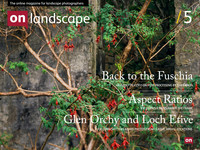 Well we have a bit of a bumper issue for our holiday special with a continuation of Joe Cornish's aspect ratio article, a discussion of finding pictures by David Langan, learning from our large format brethren by Ben Stephenson, post processing and film comparisons by Tim Parkin and book reviews from Doug Chinnery and Tim Parkin of David Noton's Full Frame and Michael Frye's "In the Footsteps of Ansel Adams and the Great Masters" and his great new ebook on post processing in lightroom. We also have Chris Friel as featured photographer and the legendary Bill Brandt as our master photographer. Well we've finally ironed out a few bugs in our system and we're hoping on getting the company car back on the road (our 4x4 campervan) which should allow us to resume the location guides we know you've enjoyed. We've also been looking at technology to help us stream video better which could allow you to jump to the middle of a video if you need to come back to it (I know a lot of you have asked for this). We're planning a big camera comparison at some point too with everything from iPhone's to Phase 65Mp backs with some film from 35mm to 8x10 thrown in for good measure. I'm looking at the disappearing berries issue in some more detail and have new instalments of the film comparisons. We're hoping to introduce new articles on printing and composition in January as well. We're also trying to get our schedule sorted out so we can post everything at once on a regular date (woo!) and we might even be able to tell you what's happening in the next issue ahead of time (don't get your hopes up though).